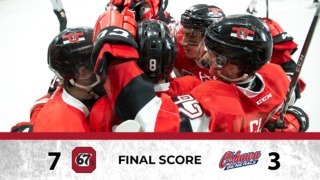 The 67’s capped off their weekend road trip in style Sunday afternoon, erasing a 2-0 deficit and then downing the Sault Ste. Marie Greyhounds 5-4 in overtime. Kody Clark had two goals including the winner 3:08 into overtime to give the 67’s three wins in their last four games. Mitchell Hoelscher scored his first goal of the season and assisted on Sam Bitten’s second of the year, while captain Travis Barron scored the tying goal with 33 seconds left in regulation. The win over the Soo came two days after the Barber Poles saw their three-game winning streak end in Sudbury. After coming into the game with his team down 2-4, 67’s goalie Olivier Lafreniere stopped all 20 shots he faced to pick up the win. The 67’s return to action Friday night at TD Place, where the club will shine a spotlight on the 1977-87 era, which included Ottawa’s first Memorial Cup Championship in 1984. 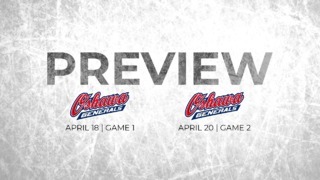 The game will feature the unveiling of the next section of the Brian Kilrea Legacy Wall, $2 hot dogs and a special appearance by 67’s legend and Stanley Cup-winner Bobby Smith. 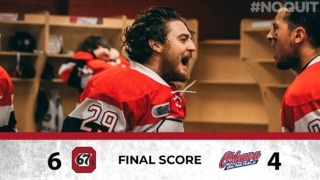 Tickets for the special October 20 67’s game against Oshawa and all 67’s games this season at the Arena at TD Place are available at Ottawa67s.com/Single-Game-Tickets, by calling 613.232.6767 or in person at The Box Office at TD Place. All minor hockey players part of the 67’s Prospect Program get in for FREE. For more information on the 67’s Prospect Program click here. The 67’s were 1-for-3 on the powerplay while the Greyhounds went 2-for-5. Kody Clark led the way for Ottawa with two goals and an assist, while Mitchell Hoelscher and Sam Bitten each had a goal and an assist. 67’s centre Sasha Chmelevski went 11-for-18 in the face-off circle. 67’s captain Travis Barron led both teams with a plus-3 rating. The 67’s are in a three-way tie with Niagara and Hamilton for third in the Eastern Conference and sit just two back of first-place Barrie.